Are you considering an outdoor living space addition to your home? If yes, a screen porch design is one fixture you can get plenty of value from while helping you increase your overall home value. A screen porch is an entertaining space for extravagant social gatherings as well as quiet family dinners. With proper construction, you can have a bug-free screen porch so you do not have to worry about being eaten alive by mosquitos in the summer. During rainy or snowy days, you can still enjoy the great outdoors because the screen porch design will shield you from the rain, snow and even protect you from sun UV rays. You can relax on your furnishing, stay dry and truly enjoy your home space with a screen porch design. To make your outdoor living space addition very enjoyable, you can add quality lighting fixtures and ceiling fans to circulate fresh air. The screen porch is perfect for multi-generational lounging, including being a safe enclosure for child’s play and a place elders can relax. A screen porch design wins the hearts of multi-generational households because the beautiful, well designed home addition truly matches the investment and improves home value. 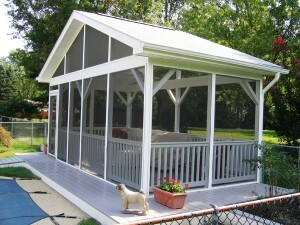 Wood material is most popular for screen porch design and very cost-effective. At the end of the day, constructing outdoor living spaces is a very affordable and easy way to increase home value and get the most out of your property. Write down your ideas for your outdoor living space theme and you can get what you want within your budget, including custom storage and second kitchen. Here at Mid Atlantic Deck and Fence we offer a variety of screen porch designs so you don’t have to worry about bugs and uncomfortable outdoor living. Instead, you can enjoy your home property to the fullest and bring to life your outdoor living space dream. It is possible to bring your indoor comforts to the outdoors. You can do it with a custom screen porch design; we are here to make it happen. Contact Mid Atlantic Deck & Fence today. On our contact page, you’ll see that you can also request an estimate online at your convenience. Mid-Atlantic Deck and Fence has been building high quality custom fences and decks throughout Maryland for decades. Today, we are one of Maryland’s leading and most innovative deck and fence companies. When it comes to building and protecting a wood deck, we are the experts You can also keep up with us on Facebook and Twitter!